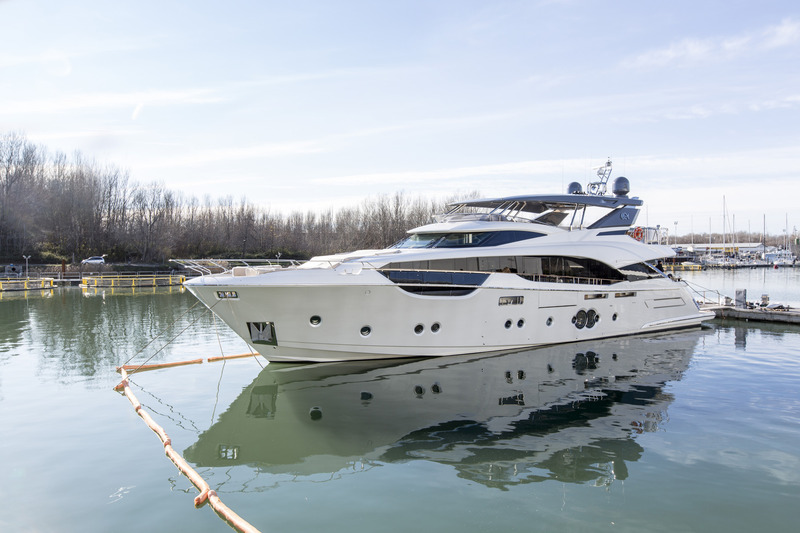 Launched in early 2018, luxury yacht ESMERALDA OF THE SEAS was built by MonteCarlo Yachts and her specifications use an L.O.A. 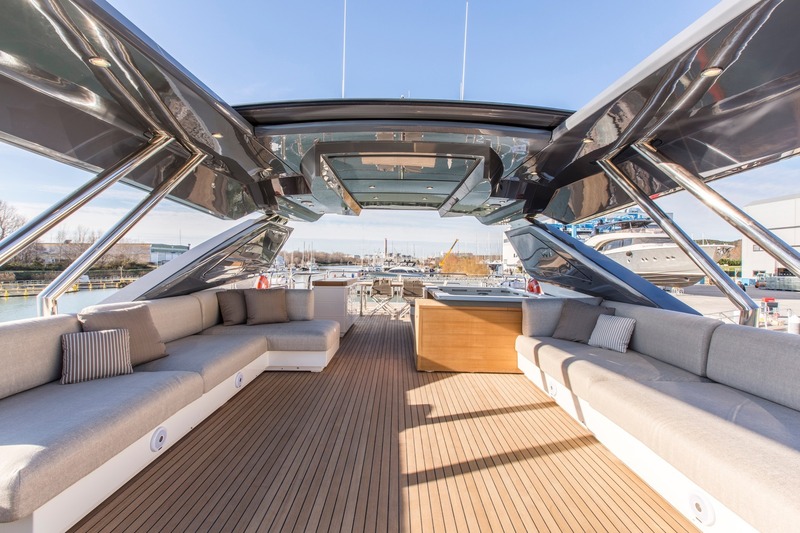 of 29.5m/96.9ft, a beam of 7m/23ft and a shallow draft of 2.1m/6.8ft for closer access to beaches and navigation through lagoons. 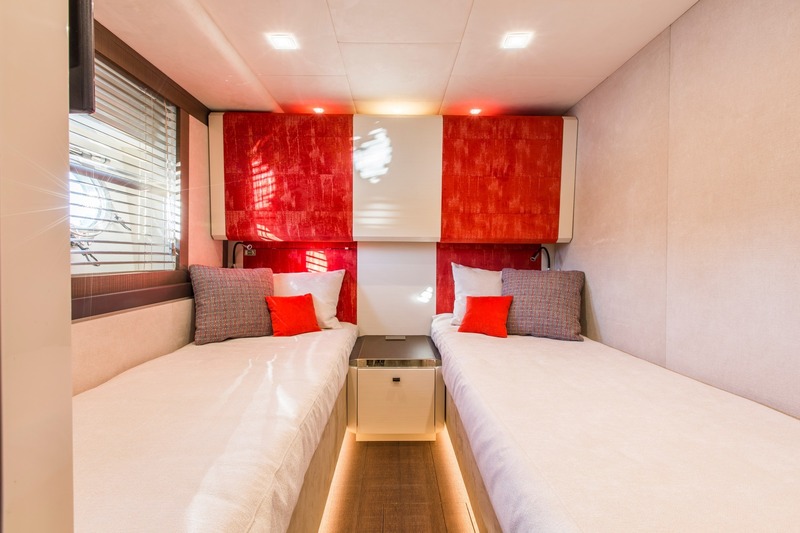 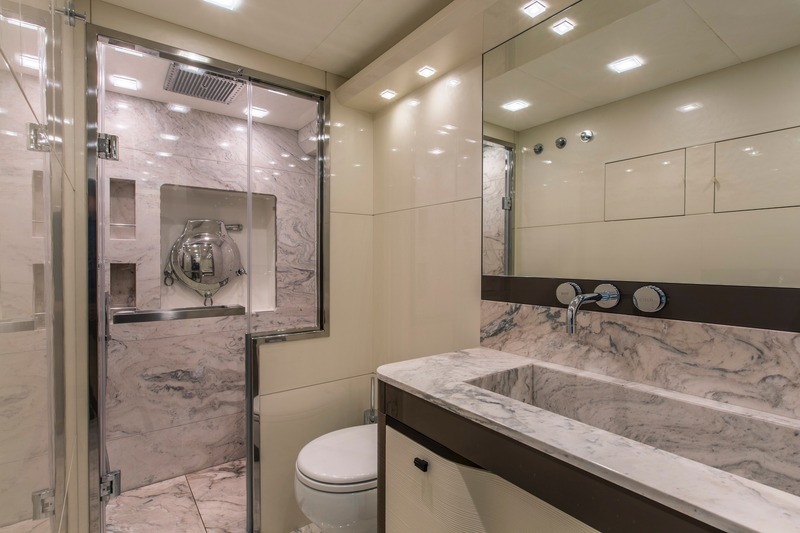 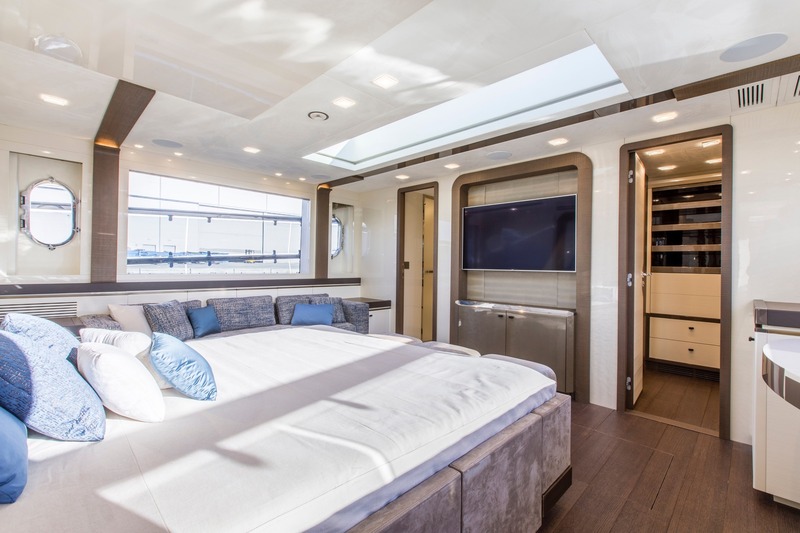 The interiors and exteriors were created by Nuvolari & Lenard for a seamless transition between recreational areas and private suites, which accommodate 10 guests across five large en-suite cabins. 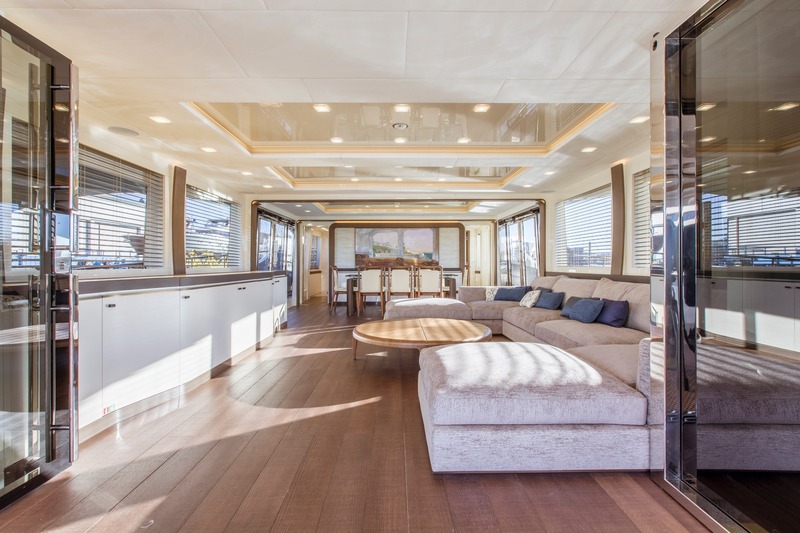 Dine alfresco or spend time with hobbies in the shade of the main deck aft, where a plush stern sofa and five armchairs surround a raised table. 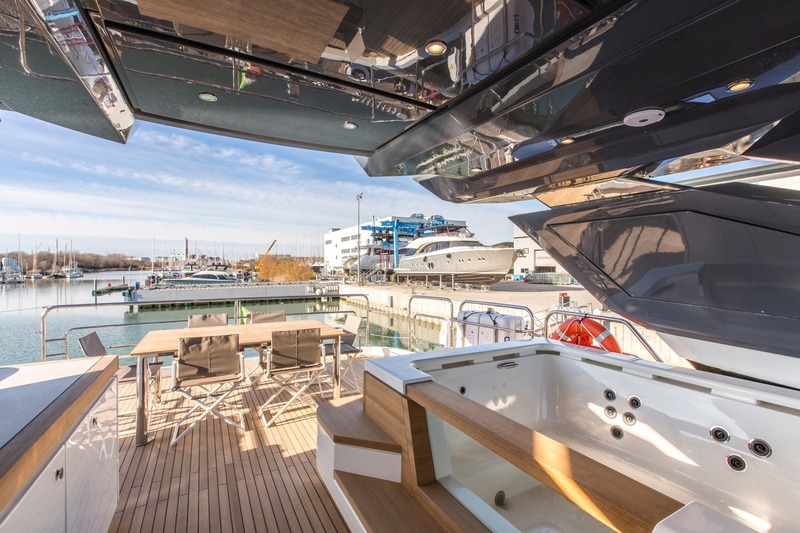 Two stairways lead down to the deep swim platform, which creates an ideal sunbathing area beside the sea. 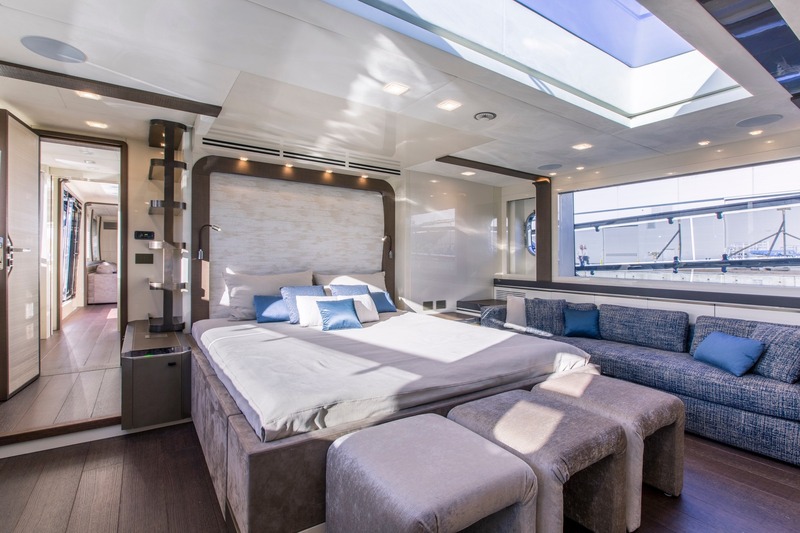 On the foredeck, a broad sun pad forms another sunbathing space where guests can take in the forward views. 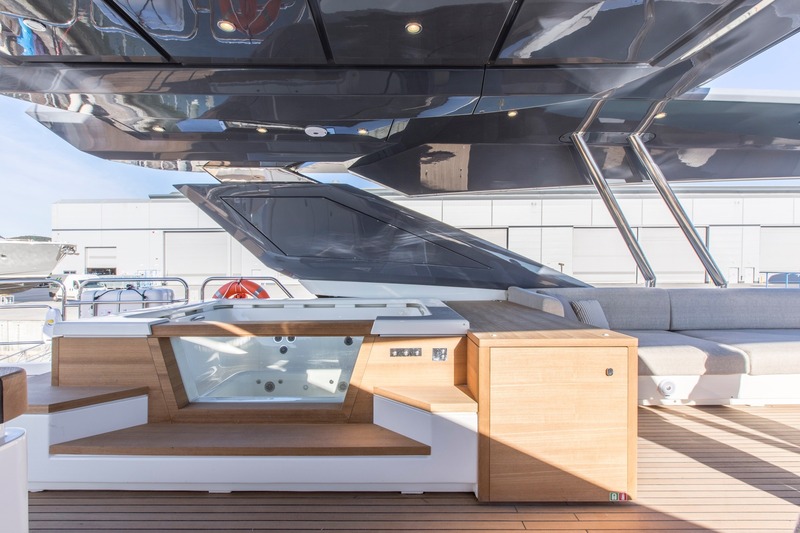 The flybridge uses gullwing sides to protect against the elements and provide additional privacy to guests using the glass-sided Jacuzzi. 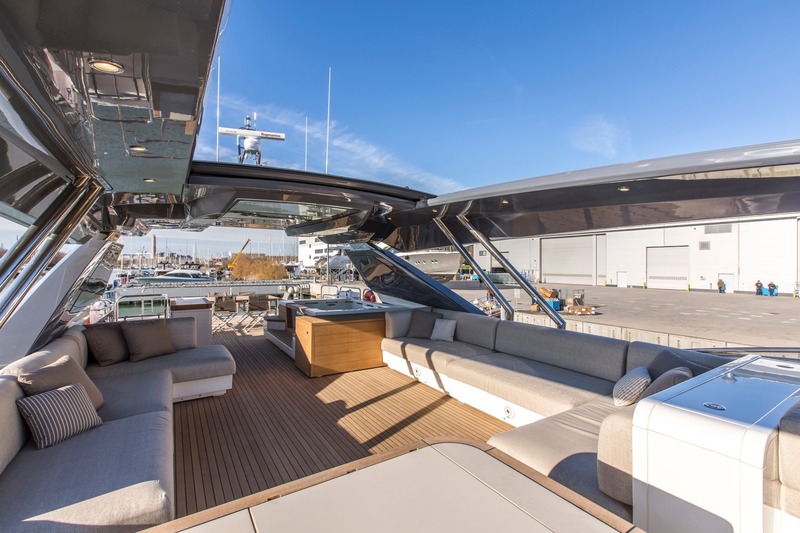 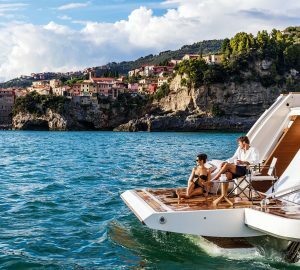 There is an abundance of seating along the port and starboard sides, and the area can be shaded or opened up to the sunshine via an automated fold-back roof. 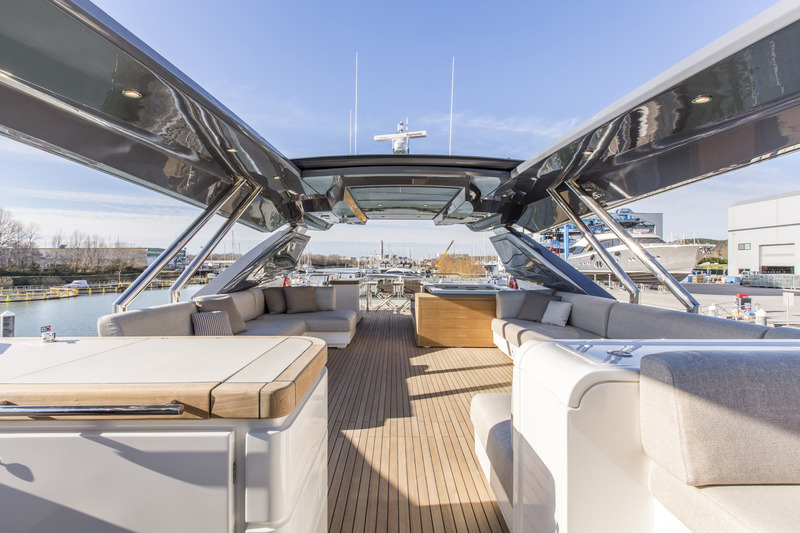 To the aft, a table for six offers casual alfresco dining with panoramic views over the stern. 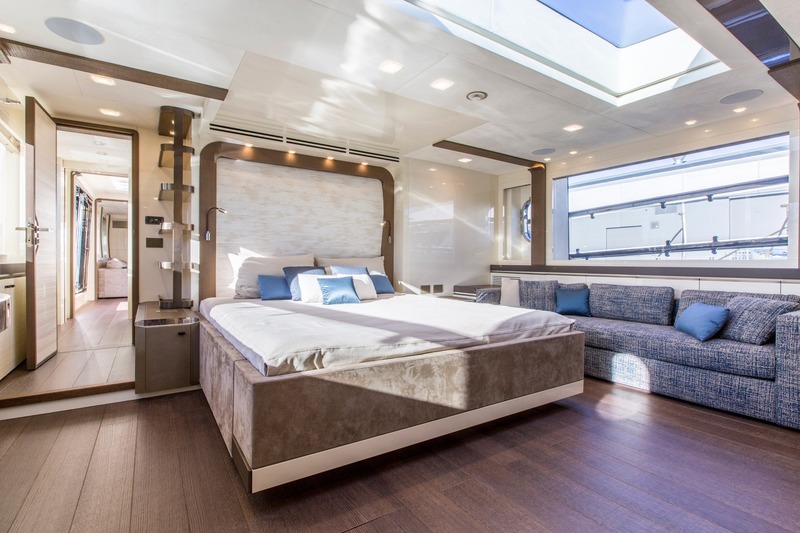 Nuvolari & Lenard chose a light colour palette for the interior, focusing on creams and golden brown tones that are enhanced by natural light. 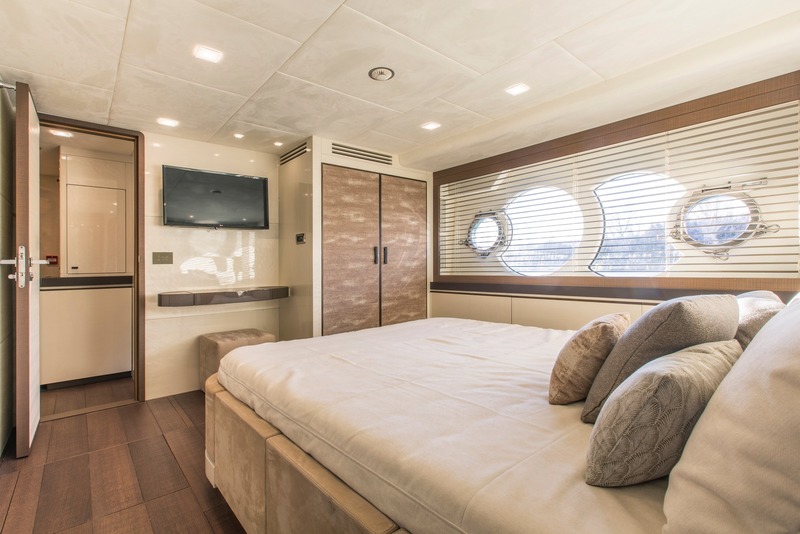 The lower deck accommodation is enhanced by large windows, with both VIP staterooms having the largest windows and the twin cabins having numerous circular windows. 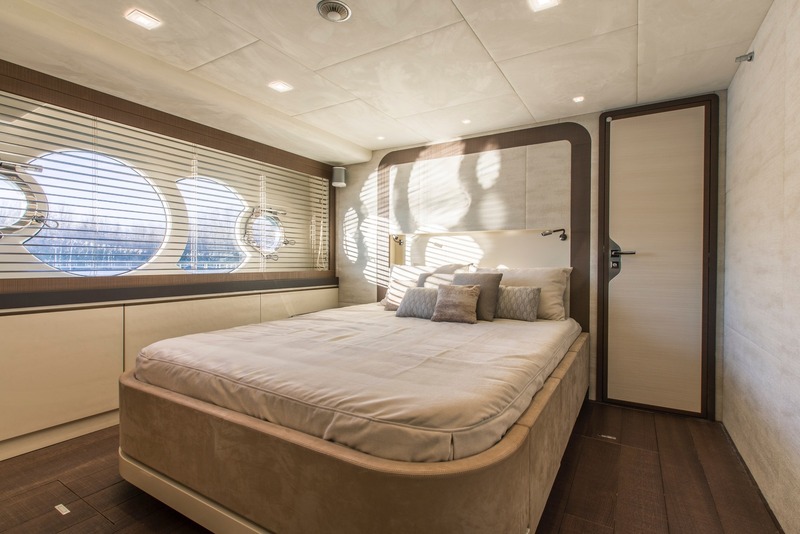 The Master suite is located on the main deck forward and the combination bedroom-lounge enjoys all-day sunshine from the skylight as well as the windows on each side of the room. 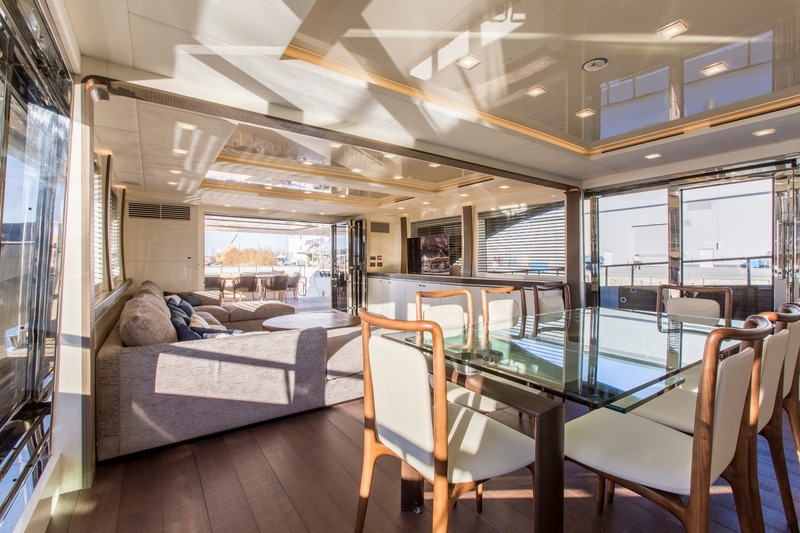 On the main deck, large windows run from the formal dining area through the salon to the large glass doors to the aft. 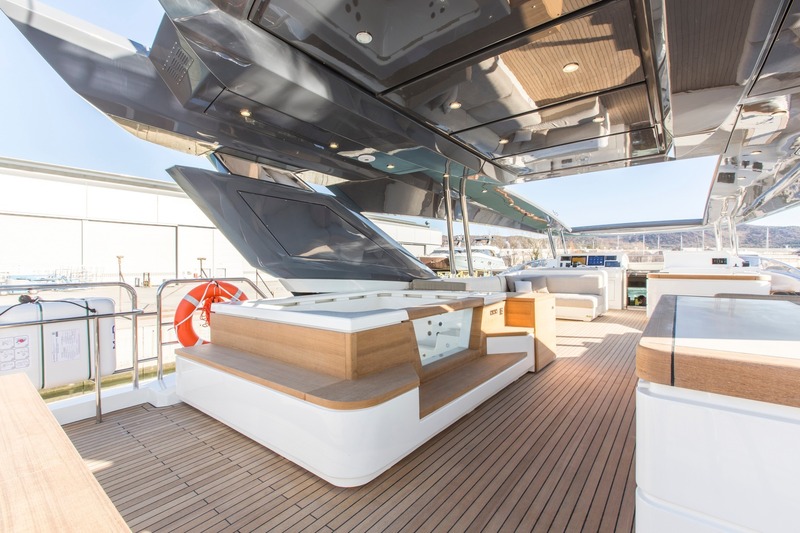 The forward dining table seats up to eight guests, and a sliding door on the port side will assist in creating airflow and produce a greater connection to your surroundings. 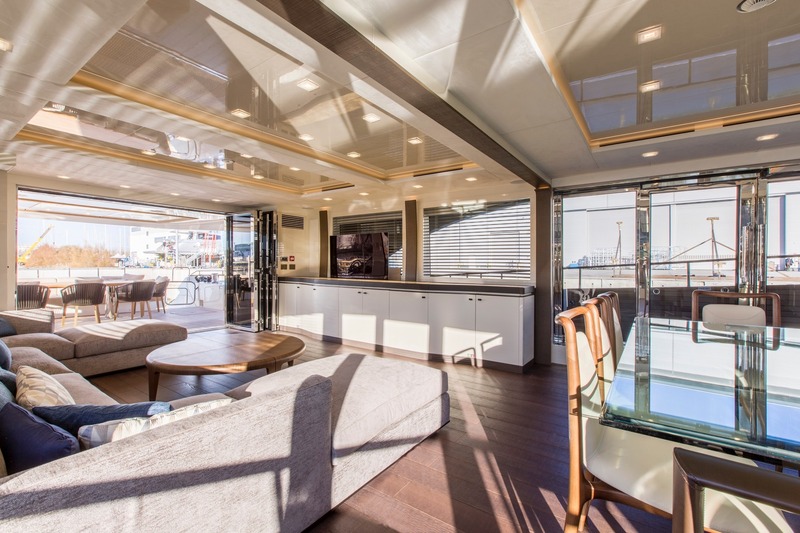 The C-shaped lounge is placed on the starboard wall close to the aft glass sliding doors. 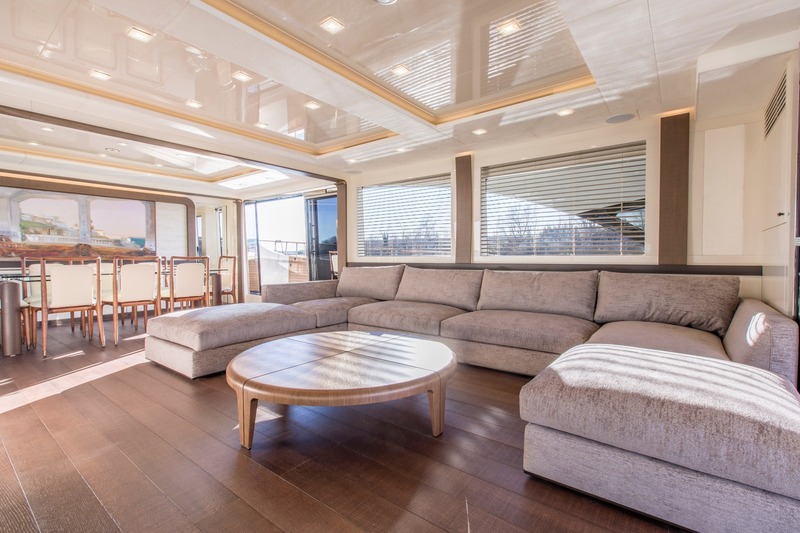 A coffee table is in the centre to hold drinks and personal items while watching a film on the widescreen TV, which disappears into the cabinetry when not in use. 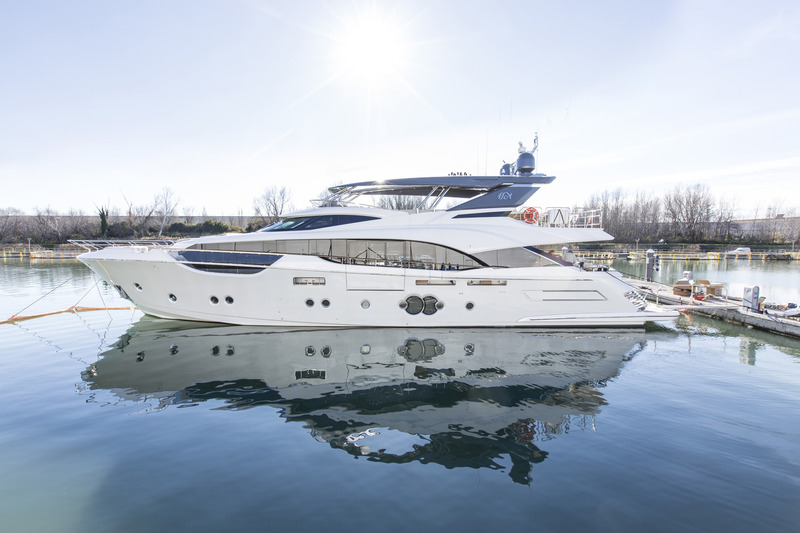 MTU 16 V 2000 M 86 engines produce a cruising speed of 15 knots and a top speed of 25 knots. 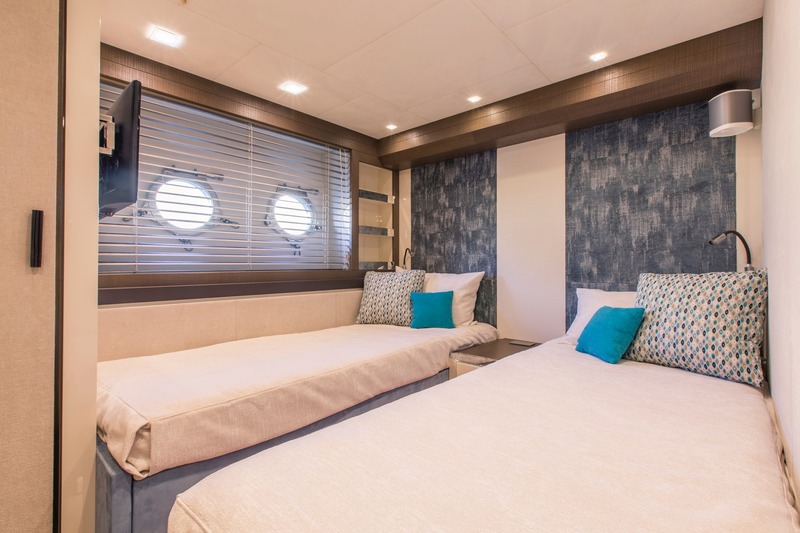 The accommodation sleeps up to 10 guests across 5 spacious cabins: 1 Master suite, 2 VIP staterooms and 2 twin cabins, all of which have en-suite facilities. 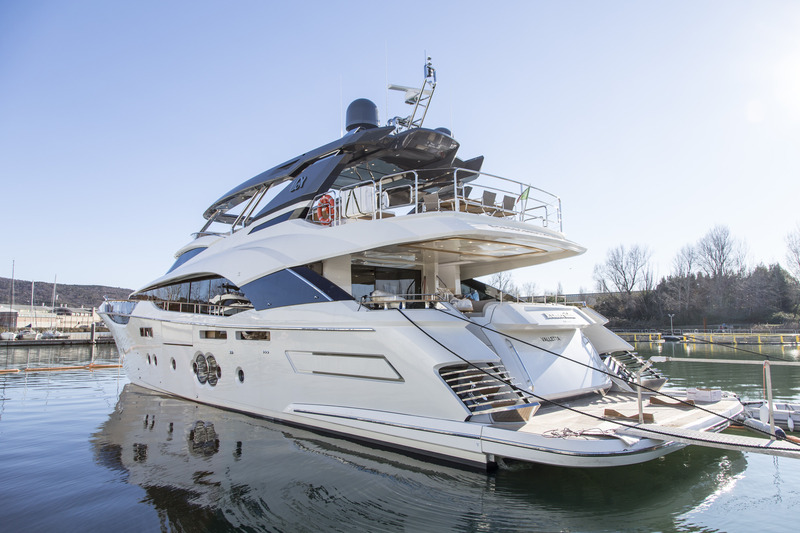 The crew of 4 will ensure that everyone on board has a safe and relaxing journey.